The very reliable "TV MoJoe" has posted that V will return to the ABC line-up a little later than expected... on January 4, 2011. The show will air on Tuesdays at 9PM, following No Ordinary Family. Images Of The V Cast At The New York Comic Con! Jane Badler, Laura Vandervoort, and Morena Baccarin all appeared yesterday at the New York Comic Con, and thanks to Warner Bros., we now have images from their public appearance. Take a look at the gallery of images! V returns in November on ABC. Own V: The Complete First Season on Blu-ray(tm) and DVD November 2! The Ladies Of V At New York Comic Con Today! Three generations of Visitor queens - Jane Badler, Morena Baccarin, and Laura Vandervoort - will be present at the New York Comic Con this afternoon. In the first season of V, the Visitors arrived. In the second, coming in November to ABC, three generations of V queens — played by Morena Baccarin (Firefly), Laura Vandervoort (Smallville) and guest star Jane Badler (Diana on the original V) — will engage in an epic power struggle over the future of humanity. Join them and V executive producer Steve Pearlman for a panel that will feature Q&A as well as footage from the new season. V is produced by HDFilms in association with Warner Bros. Television. The event will be held between 5:15-6:15pm in the IGN Theater. If any news comes from this event, look for it here! Interview: Jane Badler Talks About Her Return To V! Jane Badler returns to the V franchise in Season 2 of the new series, and several journalists including VisitorSite.net's Craig Byrne were able to visit the set of the series as they were shooting the season's fourth episode, which is titled "Unholy Alliance." Beware of some spoilers within. Read the interview at our general TV news site, KSiteTV - Spoiler Warning! V Mini-Scoop: Who Is Going To A Foreign Country? V will be going international in Season 2! We've got scoops on two places where the Fifth Column might be going in the new season... all while never actually leaving their Vancouver studio. Find Out Where - Spoiler Warning! Thanks to Derbykid, we now have video from the Morena Baccarin panel at this year's Dragon*Con! Cast members from V appeared at the Dragon*Con in Atlanta this morning, and thanks to Derbykid, we have some highlights. Beware of spoilers! - Morena Baccarin said that working with Jane Badler gave her goosebumps. - When Jane Badler appears, she will be wearing something that throws back to the original series. - Morena was asked about eating rodents and hinted at it by saying that she recently had a "difficult day at work." The amazing Elizabeth Mitchell recently spoke with E! Online's Kristin Dos Santos, and she had some very encouraging things to say about Season 2. "It comes back in November, and we just started filming. And it's so much better. I feel like [season one] set the groundwork and then it's off and running, which I needed it to be. It's more fun for me. [Erica]'s far more intense," she says. You can read the full Mitchell piece - including her thoughts on reuniting with LOST co-star Josh Holloway on V - here. Bret Harrison, who starred in the CW's sadly short-lived Reaper, has joined the cast of V in a recurring role. Entertainment Weekly's Michael Ausiello, who first broke this "exclusive," says that Harrison will be playing Dr. Sidney Miller, an evolutionary biologist who may have the scoop on what caused the sky to turn red in the finale. Look for him to show up first in the Season 2 premiere, when Erica comes to his doorstep looking for answers. History Repeats Itself: Jane Badler Will Be "Diana!" TV Guide has confirmed that the role of Anna's mother, "Diana," will be played by none other than the actress who brought a character who made the original V so memorable - Jane Badler! Their report reveals that Anna is keeping her mother (Diana) prisoner on the mother ship in a never-before-seen section that has been designed to look like the Visitors' home planet. And that's not all - it's a recurring role! Talk about this news on our forum! UPDATE: ABC has now issued a press release about Badler's return. Check it out at KSiteTV! The character of Tyler Evans is an example of the "younger generation" that will be fought over in the second season of V. The character's ties to both the Visitors - and the humans, through his mother, Erica - should bring some interesting conflict in Season 2. VisitorSite.net participated in an interview roundtable where we got to talk to the actor who plays him, Logan Huffman. Take a look at the interview but be warned of spoilers! The V panel at the Comic-Con International in San Diego was a success, and among other things we learned that Charles Mesure is now a series regular and that we will be meeting Anna's mother, named Diana... although strangely and sadly, Jane Badler has not yet been locked for the role. It is also now confirmed that V will return in November. VisitorSite.net also did a number of interviews, so look for those here within the coming days! The character of Kyle Hobbes was a powerful addition to V in the latter half of the first season. VisitorSite.net participated in an interview roundtable where we got to talk to the actor who plays him, Charles Mesure. V will indeed have a panel at the Comic-Con International in San Diego, and VisitorSite.net has the details! V Screening and Q&A – The cast and creative team behind this thrilling drama series about the world’s first alien encounter make their return to Comic-Con. V series stars Elizabeth Mitchell (Lost), Morris Chestnut (Boyz n the Hood), Joel Gretsch (The 4400), Logan Huffman (America), Laura Vandervoort (Smallville), Charles Mesure (Xena: Warrior Princess) with Morena Baccarin (Firefly) and Scott Wolf (Go) will join executive producers Scott Rosenbaum (Chuck, The Shield) and Steve Pearlman (Related) for a Q&A session with fans and to screen a special highlight reel from the show’s first season. From HDFilms in association with Warner Bros. Television, V will return midseason on ABC, and V: The Complete First Season will be released on Blu-ray and DVD Fall 2010. Become a fan of V on Facebook at www.facebook.com/V and follow the show on Twitter at www.twitter.com/VonABC. A New Column! "Ten Things I'd Like To See IN V Season 2"
VisitorSite.net's webmaster Craig Byrne has written a new column detailing his wishes for what he'd like to see in the second season of V.
V: The Complete First Season DVD Release Date Revealed! The first season of V is scheduled for release on August 24, according to the very reliable TVShowsOnDVD.com. Amazon.com already has it listed as available to pre-order on DVD and Blu-ray. Use the pre-order links below and all pre-orders made through VisitorSite.net support this site! When you order the DVD in advance Amazon has a Low Price Guarantee meaning that if the price decreases between now and the date of release, you will get the lower rate, so pre-order your copy today! Join The Resistance At KryptonSite's V Forums! VisitorSite.net's V forum at KryptonSite.com has already become one of the premier go-to places to talk about the new series. But of course, we could always welcome more people to join the community. This summer things have really started popping, with more and more V fans joining in. Join the dozens of resistance fighters who already posting! We are of peace, always! Cory Barker's review and recap of V's first season finale is now posted. What did he think? Read his review and beware of spoilers! V Season Finale: What Did You Think? What did you think of the conclusion of V's first season? Join us on our forum to talk about it! There's also a lot of discussion going on about expectations for Season 2, that all are welcome to join in on. Cory Barker's review and recap of V's eleventh episode is now posted. What did he think? We have received word from Laura Vandervoort herself that someone has been posing as her on Facebook and other websites. Laura does not have a Facebook account, public OR private. So if you see this person online, be assured this is indeed a phony. The KryptonSite Network, however, does have a Twitter, so if you want updates on V or the other shows we cover, check us out! ABC has announced their Fall 2010 schedule, and although the timeslot has not yet been announced, the network is saying they'll be premiering V in November again, and run the season's episodes interrupted. THR is reporting that the series might take over the Tuesday at 9PM spot following No Ordinary Family once Dancing With The Stars concludes. V Renewed For Season 2! The new incarnation of V has done something the original series couldn't - it has been renewed for a second season by ABC! We should know more when ABC announces their Fall 2010 schedules next week. Some sources are saying the order is for 13 episodes. ABC has released their full official description for the May 18 first season finale of V.
Laura Vandervoort (Lisa) will be spotlighted in the May 2010 issue of MAXIM. She'll also be seen on an upcoming cover for MF Magazine. Find scans in the VisitorSite.net gallery! Preview Of Next Week's V! Thanks to SycloneFX already have the promotional trailer for next week's episode, "We Can't Win." Tonight At 10PM: John May Lives In A NEW V! Another new episode of V will air tonight at 10PM after LOST. Tonight's show is called "John May." Againn, PLEASE spread the word... the best way to ensure a second season of V is if people watch the show and the ratings are good! Competition will be tougher than usual tonight with GLEE running into the 10PM hour. Here is ABC's official description of the episode, complete with spoilers. Here are some preview clips. The forum to discuss Episode #6 can be found here. If that's not enough, here's a gallery of images from the episode. Enjoy the show, come by and join us on the forum; and again, spread the message of the V's! More "John May" Preview Clips! Courtesy of MovieWeb we have now included some preview clips from tonight's V on our "John May" preview clips page. Cory Barker's review and recap of V's sixth episode is now posted. What did he think? "Heretic's Fork" Official ABC Description! ABC has released their official description for the April 27 episode of V.
Read it - Spoiler Warning! "John May" Preview Clip & New Promos! ABC has released a preview clip and two new promos from Tuesday night's episode of V, and thanks to some kind posters on Youtube, they're available for all to see. VisitorSite.net has learned that the ninth episode of V, which airs on April 27, will be called "Heretic's Fork." Even More New V Cast Promotional Images! Thanks to Mr. Video, we now have even more new individual images of the entire V cast. Find the latest additions in the VisitorSite.net gallery! The April 13 episode of V is featured in the latest issue of TV Guide Magazine, and thanks to Derbykid, we have a scan! The issue is now available on newsstands everywhere. Find the scan in the VisitorSite.net gallery! Advance Review Of Episode #6 - "Pound of Flesh!" A new episode of V airs tomorrow night (April 6), and VisitorSite.net's Craig Byrne has seen it! This installment of the series answers more questions and is all around a very strong outing. Take a look at the review! Full Episode Description For Episode #8! ABC has released a full description for the April 20 episode of V, which is called "We Can't Win." More V Cast Promotional Images! More individual images of the V cast have now been released. The new images feature Laura Vandervoort, Logan Huffman, and Loures Benedicto. Cory Barker's review and recap of V's first new episode back is now posted. What did he think? We've heard from actor Logan Huffman, who plays Tyler Evans, who has alerted us to the fact that a company called Inferis Online is selling signed photos of him. Only one problem - He didn't sign them. Please spread the word and if you want a genuine Logan Huffman autograph, the best way to know it's real is to get it signed by him directly. But for now, be warned that what you are looking at might not be real. 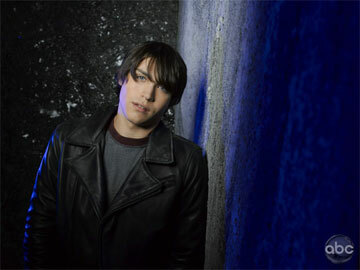 The April 6 episode of V, "Pound Of Flesh," has a few guest stars familiar to Smallville fans. Brett Dier plays the interestingly-named "James May." He was blond boy living at the Kent home in Clark's life in the "Apocalypse" alternate-reality story in Season 7. Erica Carroll, who briefly played Inza Nelson in Smallville's "Absolute Justice," is "Lillie May." Finally, Jessica Parker Kennedy, who appeared as Bette/Plastique in two Smallville episodes, will be "Grace." Egagle-eyed fans might also notice Jesse Hutch in the March 30 episode. Hutch played small roles in several early Smallville episodes, and even got killed more than once! A new interview with V executive producer Scott Rosenbaum can now be found at the L.A. Times website. He talks a bit about upcoming episodes, including the introduction of some V soldiers. After you read the interview, talk about it on our forum! Images & A Title From The New March 30 Episode Of V - "Welcome To The War!" ABC has released several images and a title for the March 30 episode of V. It will be called "Welcome To The War." Find them in the VisitorSite.net gallery! ABC has also released a short synopsis of the episode which can be found here. Thanks to Mr Video, we now have some new V promo images posted p in the VisitorSite.net gallery. The newest images posted feature Elizabeth Mitchell, Morris Chestnut, and Joel Gretsch, plus there is one photo of Scott Wolf with Morena Baccarin. V is featured in the March 12, 2010 issue of Entertainment Weekly magazine, now hitting newsstands and subscriber mailboxes. The magazine's Spring TV Preview contains some quotes from new executive producer Scott Rosenbaum hinting at what is to come in the remaining eight episodes of Season One. - "As much as possible" will be packed into each of the eight remaining episodes. "I don't want to make the audience wait," Rosenbaum says. "Every episode is going to have two or three reveals, at least." - It will all lead to a showdown between Erica and Anna, which Rosenbaum describes as "Ripley versus the alien mother." - The first episode back will be like a new pilot, and it should be easy for new viewers to come in at this time. - Expect to learn more backstory about some of your favorite characters. - Expect more callbacks to the original '80s V, including "more lizard skin," the birth of an alien/human baby, and a moment that will hopefully top Diana's eating of a guinea pig in the original series. "I promise it's something you've never seen before." V will be returning to ABC a week earlier than expected... sort of. The Futon Critic tweeted a rumor this morning that ABC would be airing a clips/recap show on March 23, a week before the March 30 return; VisitorSite.net has gotten confirmation that this indeed true. The special clips show will air on ABC Tuesday, March 23 starting at 10:06PM, apparently accomodating a few-minutes-longer-than-usual LOST. The Spring Preview issue of TV Guide Magazine has some words with executive producer Scott Rosenbaum in addition to a new promo photo. The article reveals that Rosenbaum's first order of business as the new executive producer of V was to "ramp up the storytelling speed." We'll learn more about why the Visitors are here and what exactly it is they want from us, with the article implying it's not the same thing as what they were after in the original V of the 1980's. "The Vs are animals and the one thing they care about is the survival of their species," Rosenbaum said in the magazine. "They will do whatever it takes to ensure that." The article also mentions the growing rivalry between Anna and Erica. "This show boils down to two mothers who will do anything to protect their children," Rosenbaum says. "It's all going to lead to a major battle." TV Guide Magazine's Spring Preview is now on newsstands. Thanks to Elizabeth-Mitchell.org, by the way, for first spotting this new photo. ABC has made a new promotional "poster" for the return of V.
The new imagery features Morena Baccarin's Anna and Elizabeth Mitchell's Erica Evans. It's "Us V Them" on March 30! Take a look at the new image! Is A Lizard Baby In V's Future? Robin Maxwell's giving birth to a lizard baby in the V: The Final Battle miniseries is thought of as one of the most memorable TV moments of all time. Now with the revelation that Val is expecting, could history repeat itself? New Executive Producer Scott Rosenbaum spoke with TV Guide Magazine about the possibilities. You can read that entire article at their website. Another star of a legendary sci-fi TV series will be beaming aboard once the show returns. VisitorSite.net has learned that Jonathan Frakes (Star Trek: The Next Generation's Riker) will be helming an upcoming installment of the show. The episode should be shooting soon. Read some upcoming episode spoilers! A new promotional image to publicize the March 30 return of V has now been released. Find it in our gallery! TVGuide.com has revealed that Battlestar Galactica actor Michael Trucco has landed the role of resistance leader John May on V.
TVGuideMagazine.com has posted the scoop of three new actors joining V when the series comes back on March 30. Charles Mesure, who played the Archangel Mchael on Xena: Warrior Princess, will be playing the recurring role of mercenary Kyle Hobbes, who is described as "an in-demand back ops expert who forms an unlikely alliance with the Resistance" when he is hired by them for strength in their fight against the Vs.
Nicholas Lea of X-Files fame will be playing Erica Evans' ex-husband in a two-episode arc. Canadian actress Lexa Doig will be playing Dr. Leah Pearlman, the OB/GYN for the pregnant Valerie. Less than two months before V returns! Filming for V has started up again and will continue for the next few months. VisitorSite.net has learned that the show's fifth episode will be directed by Yves Simoneau, who worked on the show's first, second, and fourth episodes which aired in November. The show's sixth episode will be directed by Dean White, whose previous credits include Castle, The District, and The Shield. If anyone is reading who would like to anonymously share episode titles, you know where to find us. VisitorSite.net has gotten official confirmation that John Wirth and Natalie Chaidez, both veterans of Terminator: The Sarah Connor Chronicles, have joined the writing staff of V for episodes that will air once the show has returned in March. Previous credits for Chaidez include the first season of Heroes; John Wirth's other credits include Nash Bridges and The District. The Futon Critic has revealed that ABC has confirmed to him that the first season order for V will now be for 12 episodes total, down one from the previously-expected 13-episode first year. ABC has also reduced the number of Flashforward episodes ordered, down to 24 from 25. This would mean the second "pod" of episodes, which begins on March 30, will now be for eight episodes. Those eight episodes begin shooting in mid-January. Fan Poll: Your Favorite Incarnation Of V? Since there are a few months before we'll even be hearing about V's new episodes, and the first four episodes of the latest version of V have now aired, we're putting a new poll out there asking for YOUR favorite version of V so far. The poll is below. You're all also invited to discuss the topic and why you voted the way you did on our forum. ABC has announced that V will be returning on March 30, 2010. It's a Tuesday, and it will be paired with LOST which will air at 9PM. Several sources (including Zap2It and TV MoJoe) are also reporting that the show will be airing at 10PM following LOST - a much later slot, but, out of the way of the ratings beasts that are NCIS and American Idol. As always (especially with this show), plans are subject to change. Discuss this news on our forum! Cory Barker's review and recap of the fourth episode of V's initial four-episode run is now posted. What did he think? V had 9.2 million viewers and a 3.1 rating for this week, keeping its audience from last week instead of dropping, which is a great sign. The consistent ratings must be making ABC happy, because the show has been announced for a March 2009 return. David Richmond-Peck's character "Georgie" has quickly become a favorite among fans of of V, and now, he's been kind enough to do an interview with VisitorSite.net where he talks a bit about his character and more. Be aware that story elements from the November 24 episode are discussed. ABC's publicity confirmed on Twitter that after tonight's episode, V WILL be making a return to television in March 2010. The exact time slot and return date are currently unknown. The show is said to begin shooting again in January, though this has not been officially confirmed. Talk About This Week's New V! "It's Only The Beginning"
What did you think of the cliffhanger-filled 2009 finale of V? Talk about it on our forum! DVR seems to be the Visitors' friend as the show saw significant gains in total viewership once playback is figured in. According to an ABC press release, "the numbers for the V debut jumped by 2.4 million viewers and by 1.0 Adult 18-49 rating point, finishing with an average audience of 16.7 million viewers and a 6.2 Adult 18-49 rating in the finalized DVR playback averages." Hopefully we'll get similar news regarding later episodes. VisitorSite.net is lucky enough to have had the chance to interview one of TV's newest stars as V's Logan Huffman speaks in an exclusive interview where he talks about his character, working with his fellow actors, and more. He even has a response for the critics who might write Tyler off as a "stupid emo kid." This interview comes a day before the thrilling "2009 finale" of V, airing Nov. 24 on ABC. Don't miss it, and enjoy the interview! Laura	Vandervoort	is	a scheduled guest on the KTLA Morning Show on Tuesday morning, November 24. For those of you in the Los Angeles area, that will be on Channel 5. UPDATE: Laura's interview is now available online (at least for now) at KTLA's website. Advance Review For Tuesday's Episode: "It's Only The Beginning"
VisitorSite.net's Craig Byrne has posted an advance review of the November 24 episode of V.
Again, V had a ratings drop this week, and although the numbers are still respectable, the show does still need to be stabilize. Perhaps ABC should pair V with LOST when the show returns in the Spring... and in a timeslot that's NOT up against NCIS. The cast of V will be making several talk show appearances this week to promote the show. Here's who you have to look forward to seeing. Keep in mind schedules are subject to change; check local listings for exact air times. Thanks to Bob for the tips. What Did You Think Of "A Bright New Day?" What did you the third episode of V? A new V promo features Anna directly addressing viewers of ABC's Dancing With The Stars. Episode 3 of V airs on ABC Tuesday, November 17. A new TVGuide.com interview with Morris Chestnut talks about a "fifth column" of good V's, human/alien relations, and even reveals a bit about the "skins" used by the Visitors which may reveal a bit more about what's to happen with certain characters. He also talks about why Ryan doesn't just tell Val the truth. Check out the interview - Spoiler Warning! Preview Clips From Tuesday Night's Episode! ABC has released nine (!!) preview clips from the November 17 episode of V, which airs Tuesday night at 8PM. The clips may contain new spoilers. Overnight ratings for "There Is No Normal Anymore" dropped a bit from last week, but hopefully that's the only drop the show will see. To drop like this from a series premiere is relatively normal, though this is a bit big. "There Is No Normal Anymore" - What Did You Think? What did you think of this week's new episode of V? Morena Baccarin (Anna) is featured in a new interview at TVGuide.com where she hints at upcoming episode ideas and future interactions for Anna. There are some spoilers involved, but all in all it's a fantastic read! Full Synopsis For Episode #4 "It's Only The Beginning"
ABC has released a full spoiler-filled synopsis for the fourth episode of V, scheduled to air on November 17. Images From Episode #4: "It's Only The Beginning"
Several images have now been released from the November 24 episode of V.
Beware of a possible big spoiler within. See the images in our gallery! Clips From The Next Episode Of V! ABC has released five clips from the second episode of V. Thanks to Andreas, we now have those to share with you! Images From The Third Episode Of V! ABC has released several images from "A Bright New Day," the November 17 episode of V.
UPDATE: Even more images have now been added. Check them out in our gallery! Also just released are four new images from the second episode of V. Since they are a bit spoilery for those who have not seen the pilot, it might be best to not provide a thumbnail here and instead refer you directly to the gallery. ABC will be launching their ABC Social: Episode Commentary feature with their posting of the V pilot episode on ABC.com Saturday, November 7. The commentary will feature executive producers Scott Peters and Steve Pearlman. Viewers weren't resistant to the coming of the Visitors on Tuesday night, as the show achieved 13.9 million viewers in preliminary overnight ratings and a 5.0 rating in the important 18-49 age demographic. Opposite stiff established original competition in Tuesday's 8 o'clock hour, including CBS' top-rated NCIS, NBC's Biggest Loser and Fox's So You Think You Can Dance, ABC's V opened a strong #1 in Adults 18-49, soaring to the top of its slot and leading second-place CBS' NCIS by 19% (5.0/13 vs. 4.2/11). In fact despite its early time period with lower overall viewing levels and with no network lead-in, self-starter V stood as Tuesday's #1 TV program overall in the key young adult sales demo and as the season's highest-rated new series debut this TV Season. In a good sign for future viewing the new ABC drama generated tune-in throughout its premiere, growing in both Total Viewers (13.8 million to 14.1 million) and Adults 18-49 (4.9/13 to 5.1/13) from its first half-hour to its second half-hour. V marked ABC's strongest performance in the time period among Adults 18-49 in 3 years (any programming) since 11/14/06. Topping CBS' spinoff NCIS: LA series debut in September by 14% (5.0/13 vs. 4.4/11 - which had the added advantage of airing out of the season opener of NCIS), V qualifies as the top-rated Tuesday night fall series debut among Adults 18-49 on any network since 2005 and ABC's highest since 2003 since 9/20/05 and since 9/23/03, respectively. V opened with the highest Adult 18-49 rating for a regular 8pm drama debut (any net/any night) since ABC's Lost on 9/22/04. Needless to say, if V keeps up this momentum, we'll soon be hearing about episodes #5 and beyond. What Did You Think Of The V Series Premiere? Now that the first episode has aired... what did you think of the series premiere of V? Talk about it on our forum! Already it has grown to become one of the largest V discussion areas on the Internet. Beyond episode discussion, you can talk about the cast, create fan art, discuss spoilers and theories, and more. Thanks again for dropping by VisitorSite.net. Hopefully this will be the first of many episodes for this new series, and hopefully you'll find VisitorSite.net to be an ideal V destination. We are of peace, always. And don't forget to come back Wednesday to find out how V did in the ratings! TVByThe Numbers is reporting that the Sunday airings of classic V did quite well for the Syfy cable channel, getting over 2 million viewers for The Final Battle and with both miniseries hitting their top fifteen for the week. This could bode very well for new V tonight. Syfy will be continuing to air the classic V weekly series through 4PM today (though be warned, it's not very good). Then, from 4PM-8PM leading into ABC's premiere of V, Syfy will be re-airing the original V mini-series, which is a much better example of what the original V actually was. See the full report at TVByTheNumbers! TV MoJoe has revealed that Scott Rosenbaum, a producer whose credits include Chuck, has now been appointed as an executive producer/showrunner for V, replacing Scott Peters. The article also mentions that the show is set to return in March after the initial four-episode run which begins tonight. The series premiere of V is almost here - airing Tuesday night, November 3! - and on the eve of the big premiere, Laura Vandervoort has done an interview with VisitorSite.net where she talks about her character of the Visitor Lisa, the show and what to expect, the possibility of a Smallville return, and more. Check out the interview - beware of some spoilers concerning the Visitors' true nature! Scott Wolf is a scheduled guest for tonight's episode of Late Night With Jimmy Fallon. Chances are good that there will be V clips with his appearance, so check it out! "A Bright New Day" Promo Image! One promotional image has been released so far for "A Bright New Day," the November 17 episode of V.
Thanks to Andreas... international marketing images for V in other countries! ABC has released their full official description for the third episode of V, which airs on November 17. Chek it out - Spoiler Warning! Marc Singer Signs On For New Web Series! Soap Opera Digest and Soap Opera Weekly are reporting that Marc Singer, who starred as "Mike Donovan" in the original 1980's V, has signed on to star in an internet series titled The Republic. Singer will play the husband of a character named Martha Alden, a "working mother who evolves into an activist fighting against new laws imposed her family." Martha Alden will be played by Melody Thomas Scott. Thanks to Derbykid for the tip. Episode #3 and #4 Spoilers! ABC has released official spoilery descriptions for the third and fourth episodes of V.
Find them on the VisitorSite.net spoilers page! In this series of press kit interviews (thanks again to Andreas), Morena Baccarin talks about "Anna," her relationship to other characters, and her experience with watching the original V.
Talk about Morena Baccarin on our forum! Laura Vandervoort discusses V in this series of three press kit interviews. Thanks to Andreas for the videos. Talk about Laura Vandervoort on our forum! ABC's FULL Description For "There Is No Normal Anymore"
ABC has released a more comprehensive official description for the second episode of V, airing November 10. Find it here on VisitorSite.net! The Syfy Channel in the United States will be preparing for the second coming of the Visitors by airing the original V in the days leading up to the ABC series premiere. Here is the current schedule, subject to change. All times listed are ET. 8AM-7PM Syfy will be showing V all day. We're assuming this will be comprised of episodes of the original series. 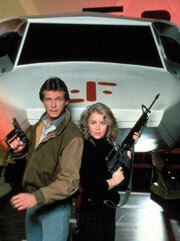 8AM-4PM Again, Syfy is doing a marathon that we assume is made up of episodes of the original weekly series. 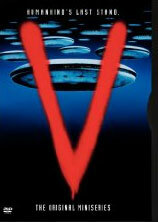 4PM-8PM V: The Original Miniseries - Then catch the premiere of V on ABC at 8:00! V Screens In London At The MCM Expo - A Week Ahead Of The U.S. Premiere! The Geek Syndicate has posted a press release revealing that V will be screened by SCI FI at the London MCM Expo on the 24th and 25th of October. You can read more details at the Geek Syndicate website. Thanks to Jonno for the tip! The title for the second episode of V has now been revealed. The title of the episode is "There Is No Normal Anymore." Read some spoilers on the VisitorSite.net spoilers page! TVGuide.com has posted this fantastic advertisement for V - airing in just three weeks on ABC! The artwork says "They Arrive November 3" and has the catch phrase of "We are of peace, always" under the eye of Morena Baccarin's Anna. Jane Badler, who starred as "Diana" in the original incarnation of V, recently did an interview with the Pittsburgh Post-Gazette's Rob Owen. In this interview, Badler talks about reaching out to the producers of the new V and what role she might play if she were to show up on the new series. "I don't think they're interested in bringing me back in the same guise," she says. "I think they want more of a surprise element so everyone would go, 'Whoa!' I think that's more interesting to them and having it done so it makes total sense with lots of integrity. I'm sure I would be a Visitor but if I was going to be part of a storyline maybe I would be a judge or a lawyer but that wouldn't be who I really am, it would be something twisted." Ms. Badler had much more than that to say... Read the entire interview on the Pittsburgh Post-Gazette website. ABC's Official Description For The V Pilot! ABC has released their official press release for the V pilot. A New Full Cast Photo From V! ABC has released a new photo of the cast of V.
The image quality isn't the greatest but hopefully a better-resolution version will be out shortly. The image features Logan Huffman, Laura Vandervoort, Scott Wolf, Elizabeth Mitchell, Joel Gretsch, Morena Baccarin, Morris Chestnut, and Lourdes Benedicto. Find this and many more new pictures in our VisitorSite.net gallery! Nearly 40 New V Promo Photos! ABC has released nearly 40 new promotional photos for V's first season. The new images feature Elizabeth Mitchell, Morena Baccarin, Joel Grestch, Scott Wolf, Morris Chestnut, Lourdes Benedicto, Logan Huffman, and Laura Vandervoort. Find them in our VisitorSite.net gallery! Billboards and promotion for V have started to pop up in the Los Angeles area, so it's likely it will soon be hitting other major metropolitan areas very soon. Thus far, bus stop posters have been seen, as has a building in Los Angeles - apparently on Sunset Blvd. though that is not yet confirmed - which has a giant "V" logo on the side of the building. If anyone reading sees the posters, take a photo and send it in an e-mail! And if anyone from the show is reading and has any spare posters to share, contact Craig. I'd love to have one. Entertainment Weekly has posted a new article revealing that V will first premiere with four episodes in November as planned, and the "production hiatus" that was broken here at VisitorSite.net will be to plan for episodes when the series makes its return after those four weeks. This "pod" plan will make the show "more like event programming," and also possibly more like the original two mini-series which were so good (that would be V and V: The Final Battle) rather than the original weekly series which was ... not so good. V might be approaching a longer production hiatus. Vancouver production charts list V as being on hiatus between September 25 - October 14. The show was supposed to resume shooting a week ago, though we're not sure if that has actually happened. No formal announcements have been made, and it's possible this is a misprint. Stay tuned for more info if and when it becomes available. V has landed on the cover of the October 2009 issue of SFX Magazine. The issue also includes information on several other new shows that are premiering this Fall including Eastwick, The Vampire Diaries, and Stargate Universe. See a larger look at the cover in our gallery! Also to look out for this week is the Fall Preview Issue of TV Guide Magazine, which includes a photo of Elizabeth Mitchell, Scott Wolf, and Morena Baccarin which you can also find in our VisitorSite.net gallery. V Shuts Down Production For A "Creative Hiatus"
Josef Adalian of TheWrap has revealed that production of V will be shutting down for a two-week "creative hiatus." Adalian reports that people familiar with the decision have indicated that the hiatus was put in place so that there would be time to beef up future scripts and put them in line with the pilot, which received a positive response from bloggers, critics, and last month's Comic-Con screening. Warner Bros. Television, who is producing the show, wants to "take advantage of our November premiere to maximize creative opportunities and deliver the audience the best show possible," Adalian has been told. This shutdown will not affect the planned air dates for the six episodes ABC plans to air starting on Nov. 3. Creative shutdowns are not unprecedented. Grey's Anatomy had a similar hiatus to perfect the series before it hit the air, and the final results were very positive. A posting in Variety today has revealed that the music for V will be composed by Marco Beltrami. Images From The Television Critics Association Press Tour! Now added to the VisitorSite.net gallery - images of Elizabeth Mitchell, Morena Baccarin, Scott Wolf, Morris Chestnut, Joel Gretsch, Scott Peters, and Jeff Bell at the Television Critics Assocation press tour from this weekend. After showing a "sizzle reel" of clips from the pilot, Scott Peters began by saying "None of us would be here without Ken Johnson." He adds: "It's an honor to move the story forward." Elizabeth Mitchell has revealed she will be traveling back to Hawaii "more than once," which implies her time with LOST is not yet over. Jeffrey Bell hints that there will be some sort of homage to the rat-eating from the original V, and that there are other iconic moments from the original that there will also be homages to. Scott Peters says some actors from the original V may show up in new roles, and we will be seeing more of Alan Tudyk after the pilot. We will know the Visitors' agenda by the end of the first season, and is NOT the same agenda the Visitors had in the original series. Season 2 will have a completely new arc. Arcs are mapped out already for the first 1-2 seasons. Elizabeth Mitchell joked that the Visitors brought down the Oceanic 815. The November 3 premiere date has now been confirmed! V will air Tuesdays at 8PM on ABC. V Premiere Date Announced: November 3 at 8PM! ABC has now confirmed that V will be premiering on November 3, taking on a Tuesday 8PM timeslot, just like Amber at the Metro newspapers groups had suggested. That's less than three months away!!! Although we've had images from the new V on the site before, now there's a much better gallery added to the site, featuring images from the new V as well as the classic series! All Of VisitorSite.net's V Interviews In One Place! Looking for more from our V coverage at Comic-Con, including our interviews with Morena Baccarin (Anna) and the show's producers? You can now find them all in one place! Concluding our string of V interviews from Comic-Con, we talk to V executive producer Jeffrey Bell about episodes after the pilot, alien queens, international storylines, visual storytelling, reviving 1980's TV shows, and more. Scott Peters and Jace Hall are two of the talented folks who will be making V happen, and in a special roundtable interview, Peters and Hall spoke with VisitorSite.net about what to expect from the show beyond episode one, the series' themes, appearances by cast of the original V, and more. She's the new face of the Visitors in the latest incarnation of V, set to premiere on ABC in November. Morena Baccarin participated in interviews with several media outlets including VisitorSite.net following Saturday's Comic-Con panel, and now we have that interview to share with you, as Morena talks about Anna, Firefly, the original series, red jumpsuits, green screens, and more. Want to be a few months ahead of the curve by wearing a phrase that will soon be bigger than "Save the Cheerleader, Save the World?" Want to trick your gamer friends into thinking you're a good guy by proclaiming that you're of peace - always? 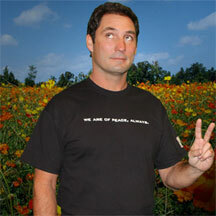 The fine folks at J!NX.com have teamed up with The Jace Hall Show to give you a special "We Are Of Peace, Always" shirt. It's even currently advertising a free Jace Hall DVD with the purchase! Order now because this is a very limited release. VisitorSite.net Special Feature: V Pilot Review! And now for something we've wanted to be able to do for a while here at VisitorSite.net... webmaster Craig Byrne has seen the V pilot, and the reaction is... it's great! Check out the review and see several reasons why this is a "must-see" for Comic-Con, and see why it shouldn't be missed when the show premieres in midseason. Follow VisitorSite.net & The KryptonSite Network on Twitter! If you'd like to get instant notifications to know when VisitorSite.net may be updated, you can sign up for the KryptonSite Network Twitter feed which shares announcements for various sites in the network - of course including VisitorSite.net but also covering KryptonSite (Smallville), HeroSite.net (Heroes), Target419 (Human Target), and more! This will especially come in handy once filming resumes and there will be more updates. Daily Variety reports that Jeffrey Bell, whose previous credits include Angel, Alias, and The X-Files, has been hired as the new showrunner for V.
"Like many people, I have had fond memories of watching the original V miniseries," Bell told Variety. "And to see how they did it now, it's epic. Scott Peters did a fantastic job relaunching it. It seems like there are so many waysthat you could go with this story." The new show will tackle issues of government, devotion, race and faith. "Especially when you look at our current times, with the economy, wars, and social strife, it's a perfect time for a force like this to come along," Bell also said. "In many ways this is a very American show, about the individual vs. society. It's about how America can appreciate and question things that seem to be too good to be true." Bell also discussed the show's definitive plan for running for a set number of episodes. "I've been on a bunch of serialized shows now, and it helps the audience to know that this is what you're in for, and this is how and when it's going to end. We've been talking about it in terms of installments, either by chapters or seasons. We'll build this first season to a big conclusion that is hopefully awesome, with a cliffhanger that launches you into the second season," Bell says. "Of the dozen series screened for clients throughout the day, it was "V," a cross between "Invasion of the Body Snatchers" and "Star Trek," that got the most upbeat comments from buyers, several of who termed it "highly cinematic" and "full of interesting characters." A Bigger Look At ABC's V Logo! VisitorSite.net now has a much bigger look at ABC's logo for V. Make it your desktop background! Screen Captures From A V Preview Promo! Here's a special treat... over 65 screen captures from a V promo that give us a look at the Visitors' spacecraft (inside & out), some iconic imagery, and maybe - just maybe! - a look at a lizard face! Take a look at the screen captures! Below are two clips from the V pilot episode. Don't forget once you've seen them that there's a gallery of images here at VisitorSite! Here It Is: A Full Gallery Of V Images! We have now posted all of ABC's new promotional images for V.
In addition to the individual cast shots, look for several shots from the series pilot - including a few featuring actors Laura Vandervoort (Smallville) and Alan Tudyk (Dollhouse/Firefly). Take a look at all of the new images! ABC has released over 30 images from the V pilot and its cast. Here's Morena Baccarin as "Anna" - one of many cast images we just posted! ABC's still-in-progress V page on ABC.com has the logo posted to your right to promote the show. Chances are it will still appear red when it's on screen. Still, looks cool, no? Thanks to Swindle for finding this. V To Have "A Beginning, A Middle, And An End"
ABC's Stephen McPherson today confirmed that V will be premiering with an order of 13 episodes at midseason. "We want to craft a whole series," McPherson said this morning when unveiling ABC's 2009-2010 schedule. "At this point we believe the show will be four parts, with each consisting of anywhere from 13 to 22 episodes," McPherson says. "It will have beginning, middle and end." While the V that is hopefully premiering this Fall on ABC will be something brand new, the concept has been done before in television, and it has been done very well. All of the original V television material is available on DVD. Kenneth Johnson's original miniseries V is the most famous, and the most successful. All of the characters from the original, who will be quite different from what you will see in this new "take," are well-formed and played by some very good actors. Marc Singer played cameraman Mike Donovan, one of the first to rebel against the Visitors. The original V had the deepest message of all of the incarnations as well. Parallels could easily be found between the Visitor situation and the situation in Germany with Nazis in World War II. A lot of this is personified in the character of Abraham Bernstein, played by Leonardo Cimino, an old man who saw the horrors of WWII and was afraid of history repeating itself. That original V two-part miniseries had huge ratings when it originally aired, but left on a note where (spoiler warning!) the Visitors were not yet defeated and Mike Donovan had not found his abducted son, Sean. So, V: The Final Battle followed, an even longer miniseries which introduced new characters such as Ham Tyler to the mythos. Although settings and situations change a lot during The Final Battle, it is also engaging television and worth a look. The final televised version of V came with the weekly V television series. Many of the actors from the two miniseries were present for at least half of the episodes. While some episodes of the series are quite enjoyable, the recycling of special effects for the two movies and the fixation on a certain character introduced in the second miniseries kind of bring it down. The 19-episode DVD set has been seen on Amazon.com at times for as low as $11.99. It doesn't seem that you need to know classic V to understand the new series, but it is recommended if you're a fan of good television. However, if you're going to check anything out at all start with the very first mini-series. It's V at its best, and if the new series even comes close in quality, it'll be a hit. Talk about the different incarnations of V on our forum! ABC has issued a press release with a synopsis on what we should expect to see, plot-wise, with V. This is a spoiler-filled introduction but it may reveal a bit more of what the project is all about. More spoilers, of course, can be found on our V spoilers page. This release may also clear up the "is Elizabeth Mitchell just a guest star" debate. Today, the world woke up to find spaceships over every major city. The Visitors claim to have come in peace, bringing gifts of medical miracles and technological breakthroughs. They promise to do no harm. They're lying. Most people believe the aliens have arrived just when we needed them most. We're eager to embrace their generous offers of help, but while tracking a terrorist cell, Homeland Security agent Erica Evans stumbles upon something far more sinister. When her partner tries to kill her, Erica discovers that the aliens have plans to infiltrate our governments and businesses, planting seeds for their plot to control mankind. Convincing anyone of the truth will be impossible because the Visitors have two powerful weapons. First, they've given the people faith with their reassuring presence and gifts. Second, they've rallied our youth. Thousands of teens, including Erica's son, have been recruited as 'Peace Ambassadors' but they're actually serving as unwitting spies. Erica's violent introduction to the truth thrusts her into the resistance movement, where she joins forces with Ryan, a rogue alien driven to save humanity. She'll have to balance her covert activities with her job, and her role as a mother, fighting to protect her son Tyler even as he joins forces with the enemy. From executive producer Scott Peters, Emmy-nominated creator of The 4400, comes a bold re-imagining of the sci-fi classic. Let the invasion begin. In 1983, producer Kenneth Johnson brought us V - a television program with lizard-like alien "visitors" who claimed to come in peace but really had their own agenda. The original mini-series is still one of the highest-rated science fiction television programs of all time - and its success spawned a sequel mini-series, an ongoing show that lasted for one season, and even a novel "The Second Generation" which served as a "next generation"-style look at the original miniseries by V's original creator. The feeling is that V would be a perfect addition to the KryptonSite Network - that is, if it even hits the air. Right now, a pilot episode is about to film. It is written by Scott Peters (The 4400) and directed by Yves Simoneau (whose credits also include The 4400). Kenneth Johnson - who has his own ideas on what to do with V - is apparently not involved. The new V will air on the ABC television network if it is picked up as a series. Some reinventions of TV work. Look at Battlestar Galactica. Some fail miserably. See Bionic Woman, another show that Kenneth Johnson had worked on which lost its heart on the second try by other producers, partly due to having villains that were more entertaining and interesting than the titular heroine. Full disclosure from the webmaster: I come into V as a new fan. I have seen some of but not all of the original material, and I understand there are people who have a lot of affinity and affection for that original material. Maybe they don't want to give this new version a chance, and I respect that. But my hope is that this new take on V will be something that will appeal to the new folks like me, and hopefully some of the old, but most importantly, I hope it is as valid of a social commentary as the original V was so many years ago. Hopefully this website will be a good fan destination, and I encourage all of you to post in the forum and let your thoughts be heard. Yes, familiar characters like Diana or Donovan aren't on here, which says to me it's just a very different take on the story not intended to step on the original. Both can co-exist, and hopefully, both will be good in the end. This site is in no way affiliated with ABC, Warner Bros. Television, the show's producers, or V's original creators. V, its logo, characters, and related imagery are ©2009 Warner Bros. Television and this page is ©2009 KryptonSite unless material is noted as coming from someone else or being by an individual author. If you're involved with this new project and would like to send news tips, please don't hesitate to send an e-mail - your contact will be confidential. We are of peace, always.